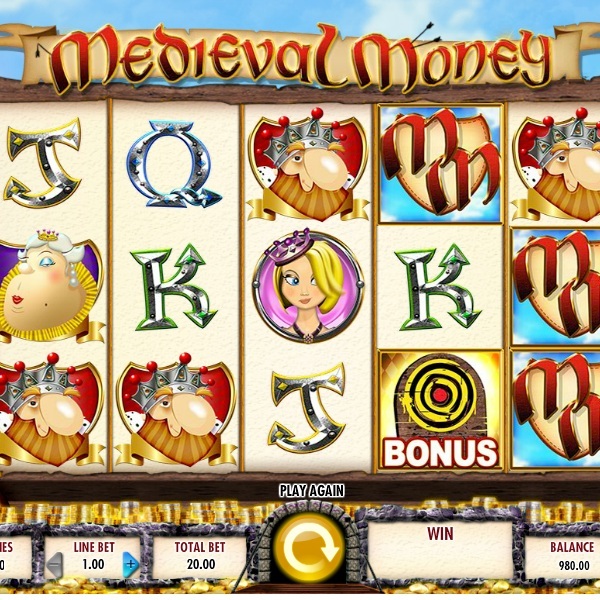 IGT’s new slot Medieval Money will take you on a trip back in time and give you the chance to win a huge amount of money. It is a 5 reel, 20 fixed payline slot with five high value symbols: the game’s logo, the king, the queen, the princess and the knight. The jester’s hat is wild and there is a large target bonus symbol. When the bonus symbol lands on reels 2, 3 and 4 then you are shown nine targets and need to pick one to trigger one of the four bonus features. In the Money Bags Picker you need to pick from three bags to receive a multiplier of up to 50x. In the Joust Free Spins you receive 7 free spins which include jousting wild knights which spread on the reels. In the Spell Picker bonus you pick from five spell bottles to receive a multiplier of up to 100x. Finally in the Dragon Path bonus you work along a path by spinning a wheel and win larger prizes the further you progress.